The Tony-winning musical revival “She Loves Me” will become the first Broadway production to be broadcast live in a deal with online streaming service BroadwayHD, it was announced Wednesday. The show, which stars Laura Benanti, Zachary Levi and Jane Krakowski, will be available for home viewing on Thursday, June 30, at 8 p.m. ET, recorded live from Roundabout Theatre Company’s Studio 54. It will be produced in association with Ellen M. Krass. “As a nonprofit institution, this is an incredible opportunity for us to share Scott Ellis’ new Broadway production beyond our subscribers, donors and other ticket buyers for our limited run at Studio 54,” said Todd Haimes, Roundabout Theatre Company’s Artistic Director. The 1963 musical, with a book by Joe Masteroff, lyrics by Sheldon Harnick and music by Jerry Bock, follows two parfumerie clerks (Levi and Benanti) who bump heads on the job but are secretly swapping anonymous love letters. Ellis’ acclaimed revival won the 2016 Drama Desk Award for Outstanding Revival of a Musical as well as a Tony for David Rockwell’s jewel-box scenic design. “She Loves Me” runs through July 10 at Studio 54. "Hamilton" Greets James Corden To kick off the show, the cast of "Hamilton" parodies its own opening number to introduce James Corden as the Tony host. "It needs a trouble-maker, a mover and a shaker. It needs that chubby dude from 'Into the Woods' who played the Baker." Classic! Opening Number James Corden takes a typically self-deprecating approach to his own opening number: He reimagines his boyhood self dreaming of being on the stage -- and quick-changing through classic roles from the Phantom to the Lion King to Maria in "The Sound of Music." "She Loves Me" Jane Krakowski does an impressive split. Zachary Levi stumbles a bit on a not quite note-perfect rendition of the title song. 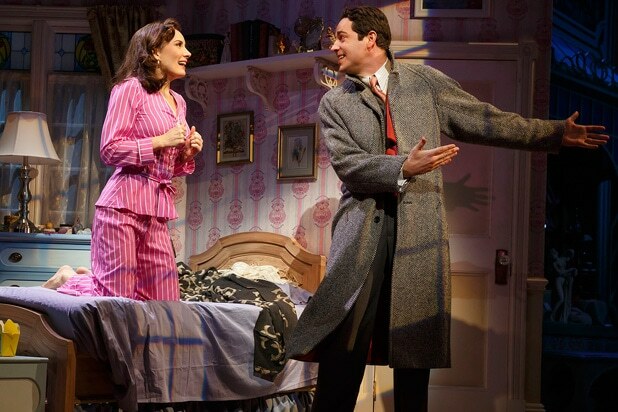 But Laura Benanti belts the heck out of "Vanilla Ice Cream." "The Color Purple" "I'm beautiful and I'm here," declares Cynthia Erivo at the end of this medley from the Tony-winning revival. Yes, she is. And it's no wonder she snatched one of the few non-"Hamilton" Tonys. "The Fiddler on the Roof" Danny Burstein leads the ensemble in the staple "Sunrise, Sunset" before the energetic chorus kicks up (and squats down for) some athletic dancing. "School of Rock" Despite the high energy, this wasn't the strongest number from the youthful show, which is an adaptation of the big-screen comedy with an unlikely pedigree -- music by Andrew Lloyd Webber, book by "Downton Abbey" writer Julian Fellowes. "Bright Star" Steve Martin and Edie Brickell introduce the rousing bluegrass anthem "If You Knew My Story" from their own new musical. "Spring Awakening" Deaf Theater West's groundbreaking revival, which has sadly closed, cleverly combined sign language and choreography to powerful effect. Plus, you can spot "Glee Project" contestant Ali Stroker as well as "Smash" alums Krysta Rodriguez and Andy Mientus. "Shuffle Along" Audra McDonald, tragically snubbed for a nomination this year, hoofs up a storm. The number also showcases Savion Glover's choreography -- which was similarly passed over by Tony voters in the "Hamilton" near-sweep. "On Your Feet" Gloria Estefan duets with her onstage alter ego, Ana Villafane -- even though the show didn't manage to land a Best Musical nomination. Best part: Lin-Manuel Miranda conga-ing with two of the pint-size cast members. "Chicago" Bebe Neuwirth sings just a few bars of "All That Jazz" to celebrate the 20th anniversary of the hit revival that won her a Tony in 1997. "Hamilton" Lin-Manuel Miranda & Co. did not throw away their shot. "Waitress" Tony winner Jessie Mueller & Co. sing a bit of the opening number and then cede the stage to their composer, Sara Bareilles, for the big 11 o'clock ballad -- who then hands it back to Mueller. "Hamilton" Pt. 2 OK, so the trio is a little pitchy in this rendition of "The Schuyler Sisters," which closed the Tony broadcast. But the sentiment was spot-on: History is happening, in the greatest city in the world.